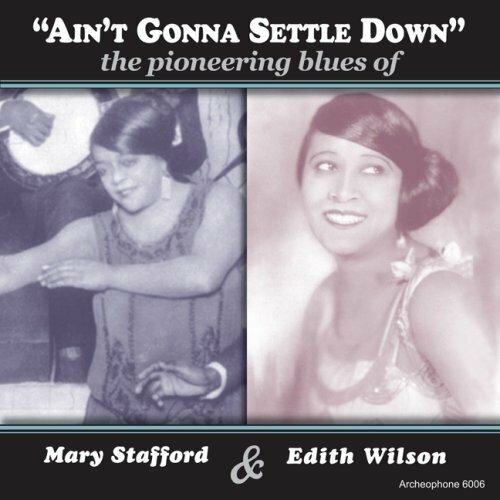 Ain’t Gonna Settle Down: The Pioneering Blues of Mary Stafford and Edith Wilson is a wonderfully packaged 2-CD set that marks the sixth installment in Archeophone’s Jazz, Dance & Blues series (previous titles in the series explore the works of Art Hickman’s Orchestra, the Six Brown Brothers, the Benson Orchestra of Chicago, and Wilbur Sweatman’s Original Jazz Band). Based in Champaign, Illinois, Archeophone Records has established itself as one of the premier historical reissue labels. Over the past ten years they’ve released over 40 superbly remastered recordings, all drawn from the acoustic era (early 1890s to mid-1920s). One of the primary factors that sets Archeophone apart from other reissue labels is the level of scholarship that goes into each and every set. The liner notes for Ain’t Gonna Settle Down are no exception—topping out at 30 pages in a font small enough to require bifocals, they include as much detail as one can possibly cram into a standard size CD booklet. The biographical essay, “Stafford and Wilson: Trailblazers in a Brave New World” by blues scholar Steve Tracy, presents the complete story of these two artists which I will briefly summarize. Mary Stafford was one of the earliest recorded blues singers, preceding Bessie Smith in the studio by two years. Her career and contributions, however, have been largely forgotten. Tracy attributes this oversight to a general dearth of research into early female blues singers who were more closely affiliated with the vaudeville stage and performed a sophisticated, hybrid form of the blues backed by jazz combos. Instead, scholars have paid far more attention to the early female blues shouters. Details on Stafford’s life remain sketchy. Born around 1895, possibly in Missouri, she became a popular figure in the 1920s, performing frequently with Eubie Blake, Bessie Smith, and Willie “The Lion” Smith. In 1921 she recorded 13 sides for Columbia in New York, backed by Charlie Johnson’s Orchestra (listed on the recordings as Mary Stafford and Her Jazz Band), consisting of trumpet, trombone, clarinet, and alto sax, with Johnson on piano. Although Stafford continued to perform until her death in the late 1930s, she would only visit the recording studio one more time in 1926, when she recorded two double-entendre blues songs for Pathé-Actuelle. The first CD includes the entire output of Stafford’s recording career, with the exception of a “Shuffle Along Medley” from 1921 which was never released. Two of the sides recorded in 1921 were “covers” of songs previously recorded by Mamie Smith, including the “Royal Garden Blues” by Clarence and Spencer Williams, which became a standard and was later recorded by a wide variety of artists ranging from Ethel Waters and Sissle & Blake to Tommy Dorsey and Count Basie. Another highlight from the 1921 sessions is “Down Home Blues,” a 12-bar blues standard with some great “crying effects” provided by band. The last two songs, recorded in 1926, are perhaps most notable for the contributions of Buster Bailey on clarinet. “Ain’t Nobody to Grind My Coffee in the Morning,” displays a less refined side of Stafford, sung in a lower register with a bit of wailing on the side. The final track, “Take Your Finger Off It” is a humorous ditty which obviously refers to a part of Katie King’s anatomy—and not her “signet ring” mentioned in the opening stanza. The remaining 10 tracks on the first CD and the entire second CD are devoted to Edith Wilson, a native of Louisville, Kentucky, who Tracy considers an underappreciated popularizer of the vaudeville/cabaret blues. Wilson had a long and fascinating career which lasted from the 1910s to the 1970s and included work on the stage, in the studio, and on the silver screen. She initially made a name for herself in the 1920s as a performer in various African American musical revues such as the Plantation Revue, Creole Follies, and Jazzmania Revue, and the London tours of the Blackbirds Revue and From Dover Street to Dixie. Between 1921 and 1925, Wilson participated in 21 recording sessions for Columbia, resulting in 26 sides that were ultimately issued (11 were never released). Wilson’s big break came in 1929 with a starring role in the Hot Chocolates revue. She also starred in Shuffle Along of 1933, Blackbirds of 1933 (and 1934), and the Rhapsody in Black Revue. In 1939 she moved to California and gained roles in the films I’m Still Alive and To Have and Have Not, followed by a stint in the 1944 Showboat revival with Todd Duncan. Wilson was also a member of the cast of the Amos and Andy radio show and portrayed Aunt Jemima in various commercials—roles that were not without controversy in the African American community. She revived her career in the 1970s, making several recordings for Chicago’s Delmark Records and appearing in Blacks on Broadway, before passing away in Chicago in 1981. There are many highlights to be found on Wilson’s portion of the set. Several tracks reprise her stage roles, such as the 1929 Brunswick recordings of the Andy Razaf/Fats Waller/Harry Brooks’ songs “(What Did I Do to Be So) Black and Blue” and “My Man Is Good For Nothing But Love” from Hot Chocolates. Also featured are the songs “Loving You the Way I Do” and “The Penalty of Love” from the 1930 musical revue Hot Rhythm, with accompaniment provided by well-known jazz trumpeter Bubber Miley and His Mileage Makers. Jazz aficionados will no doubt also appreciate two sides recorded for Columbia in 1924—“Daddy Change Your Mind” and “I Don’t Know and I Don’t Care Blues”—that are backed by a band featuring Fletcher Henderson on piano and Don Redman on clarinet. Two other sides from 1924—“How Come You Do Me Like You Do” and “Muscle Shoals Blues”—showcase the guitar accompaniment of Roy Smeck (listed as “Alabama Joe”), a veteran of the vaudeville circuit and hundreds of recording sessions. Ain’t Gonna Settle Down will be of interest to fans of early jazz, blues, or vaudeville, and should also be considered for inclusion in university music libraries. Anyone interested in exploring early recordings by African American artists will find a number of other must-have titles in the Archeophone catalog including: Lost Sounds (the companion CD to the book by the same title); The Complete Bert Williams (3 CDs spanning 1901-1922); and Marion Harris: The Complete Victor Releases. Attractively priced package deals can be found on the label’s website. This entry was posted in African American Culture & History, Blues, Jazz and tagged Blues, Buster Bailey, Edith Wilson, Fletcher Henderson, Hot Chocolates, Hot Rhythm, Jazz, Mary stafford, Vaudville by aaamc. Bookmark the permalink.